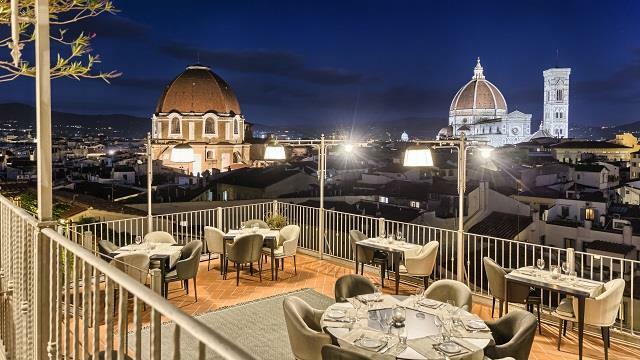 The ultimate guide to the 10 best rooftop bars in Florence in 2019. 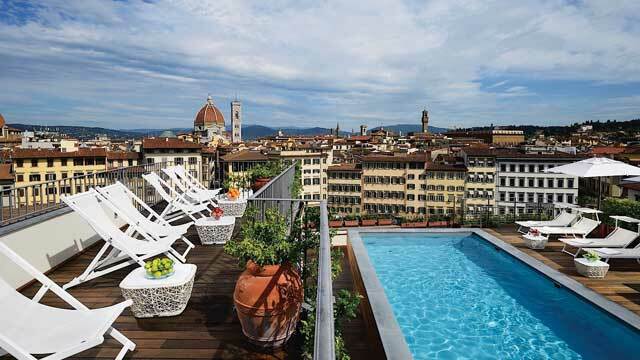 Which are the best rooftops in Florence? Here's a complete guide with all info you need about each rooftop. Dress code, opening hours, photos, maps and much more. 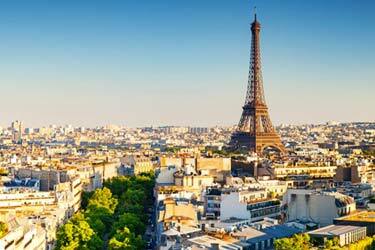 One of the world’s most romantic cities. Florence is packed with cozy and romantic restaurants and cafés. And the rooftops here are no exception. Romantic, cozy and luxurious at the same time. 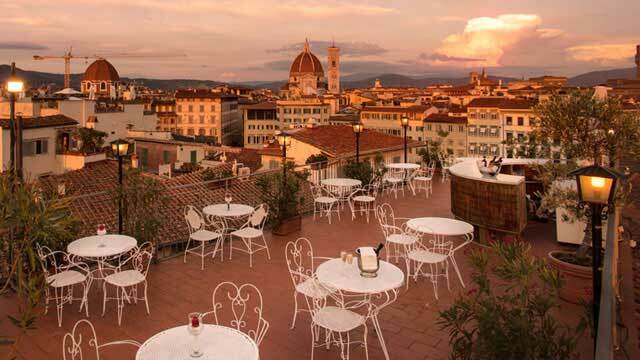 So, which is the best rooftop bar in Florence? 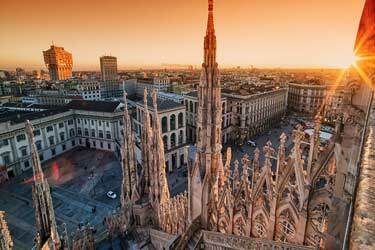 Look down and find the Florence rooftop bar best suited for you. Or use the Florence rooftop map in the bottom right corner. 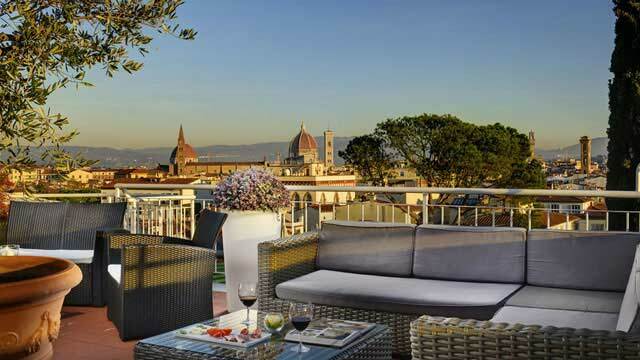 Located right in the heart of Florence, on top of the amazing Grand Hotel Minerva. The views from the up here are absolutely stunning, 360-degree over Florence, with the Cathedral as powerful background. The terrace is divided in different sections, where one is the fantastic rooftop pool area, only open to hotel guests. The other sections are open to all, and from the rooftop bar you can order Italian bar bites along with Prosecco and well made cocktails. 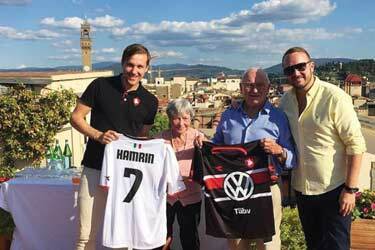 Perfect terrace to visit for sun downers with panoramic views over Florence. This sophisticated and luxurious rooftop is located on the top floor of the medieval Consorti tower at the suberb Hotel Continentale, close to the famous Ponto Vecchio bridge. This means fabolous views of of the Arno, as well as of the Cathedral and many other of the Florence historic buildings. Modern and stylish decor on the terrace, with a large lounge sofa running all along the edge and a cool cocktail bar offering a large selection of Italian bubbles and wines, along with well crafted sparkling and signature cocktails. 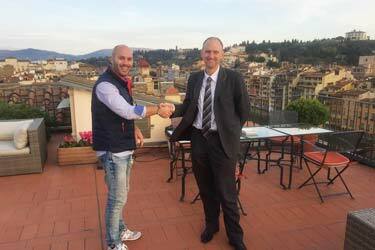 A very luxurious rooftop terrace, showing off with a lovely rooftop pool and an American rooftop bar called Empireo, along with an absolutely stunning view of Florence skyline and all the way to the Tuscany Hills. During daytime the terrace and pool is a resfreshing oasis for guests at the hotel, but after 7.30pm all summer nights the terrace opens up for everyone. Equipped with both bar stools and comfy lounge chairs, this terrace is the perfect place to enjoy magical sunsets over Florence along with well crafted cocktails and different live music acts. A perfect place to perceive the voices from the plaza and streets below, to gaze at the rooftops of the historical buildings in Florence and to enjoy the beautiful view of the Florentine Hills while sipping a Tuscan wine. Built from the loggia on the top floor of the building, Loggia Roof Bar is the pride of Hotel Palazzo Guadagni. With great location in the Oltrarno area and a historical and charming vibe, this is an exceptional spot for a harmonious and delicious cocktail or aperitif. Perched on top of The Westin Excelsior, this is both a cozy rooftop bar and an excellent rooftop restaurant. 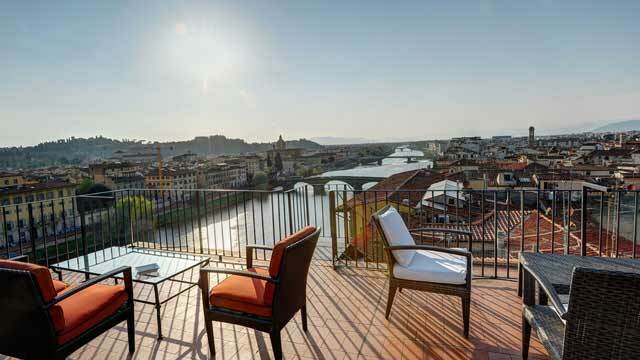 Located on the banks of river Arno, with a magical view over the entire Florence. The rooftop consists of an indoor, 'glass-hut' restaurant and two terraces, one dedicated to the restaurant and one to the bar. Enjoy lunch and dinner described as 'Tuscan cuisine with a touch innovation', or go for signature and old style cocktails, exclusive wines and a great aperitif at the rooftop bar. Perfect for both a long and relaxing lunch in the sun, or a romantic apertif enjoying the amazing sunset views. 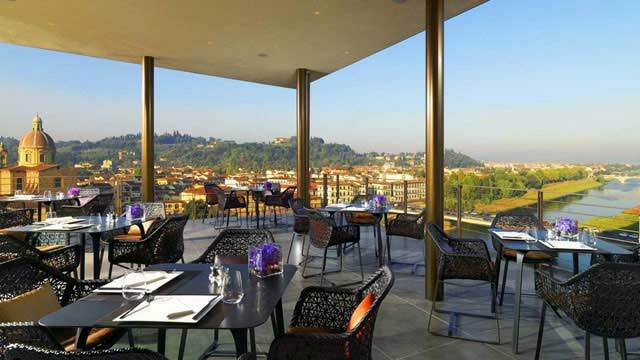 The rooftop terraces at Antica Torre Tornabuoni offers absolutely stunning views over Florence and its surroundings. From here you can see the Arno river, all the historic buildings and the beautiful mountains and plains of Tuscany. And all this in a very private and harmonious atmosphere, since they are not open for anyone to pop by. One is for reservation of larger event, and one is exclusively for hotel guests. So to enjoy breakfast and exclusive wines up here, book your stay at the small, cosy and luxurious family hotel Antica Torre Tornabuoni. A fantastic rooftop restaurant at bar, located on the 5th floor of Grand Hotel Baglioni, right in the heart of the city. 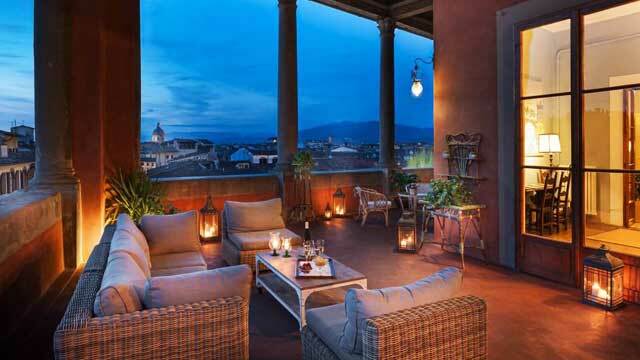 From this cozy multi level terrace you get spectacular panoramic views over the Florence skyline. The restaurant serves traditional Tuscany cuisine with fantastic flavours and great Italian wines all year round. And during summer, the B-Green rooftop bar is open, where you can enjoy classic well made cocktails and nightly rooftop apertifs in a lovely roof garden setting. A quite simple but very cozy rooftop bar in central Florence. 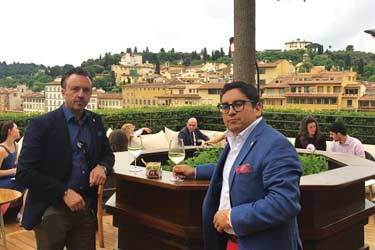 Up on the terrace you get a fantastic 360-degree view of all of Florence and its surroundings, including cool views of the famous Doumo and also over the hotel pool and garden. Really a little oasis in the middle of the Florence, decorated in classic garden style, feeling more like an 'Italian home' rooftop terrace than a modern rooftop lounge. From the rooftop bar, which is open during the warmer sumer months, you can order tasty cocktails to enjoy in a very relaxed atmosphere. Reported as closed for construction as of Semptember 19th 2018. A small rooftop terrace located on the luxurious and famous shopping department store La Rinacente. More like a rooftop café than a rooftop bar, this is a perfect spot for a break in the shopping or just a coffee or a glas of wine in the Tuscan sunshine. With a beautiful view of Piazza la Repubblica, along with the Duomo and all the way to the Tuscan hills, this is a popular spot on a sunny day, so be prepared for a bit of waiting to get a table on the terrace. 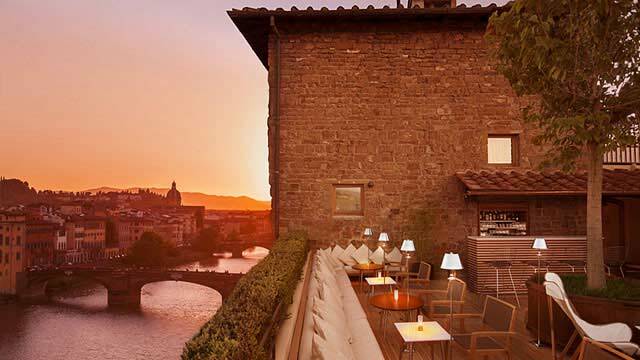 A spacious and lovely rooftop bar and restaurant perched on top of Hotel Kraft, located in a quiet residential area of Florence, close to the River Arno. From the roof terrace you get quite an outstanding view over the whole of Florence, and especially over the old town. Set over two terraces, where on one you find the Terrazza Rossini, with dining tables and and lounge sofas for anyone who want to enjoy fresh Italian dishes along with specialty cocktails and apertivo in a relaxing and romantic atmosphere. Then there is a smaller raised terrace with a lovely rooftop pool and sun loungers where hotel guests can enjoy all day. 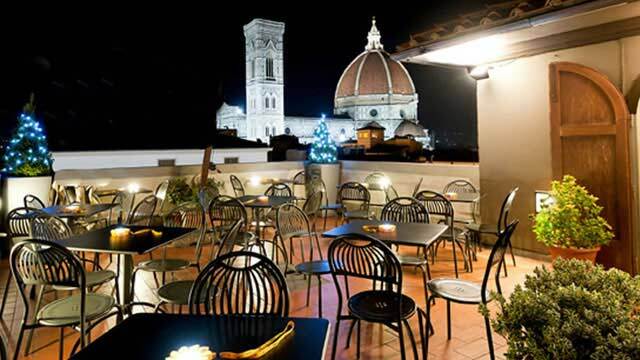 Regarding rooftop bars in Florence there are some very nice ones to visit. The scenery and the views are amazing from the terraces and the food and drinks are also of the highest quality most of the time. 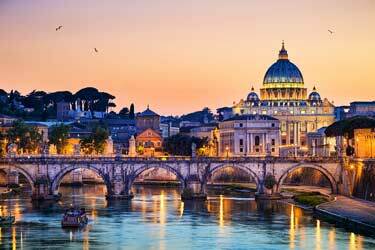 Perhaps Italy's best city in terms of nice and cozy places to drink with a view at. The Florence rooftop bars have fantastic city views over the most historical buildings here. Most of them are located at a hotel and you can say that the typical Florence rooftop bar is romantic and with a lovely view. If you like harmony, great views and tasty drinks, visiting any of these sky bars is a good idea. 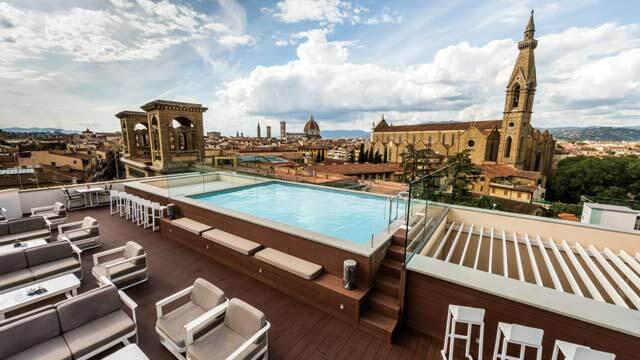 And here's a list of the best hotels in Florence with a view. 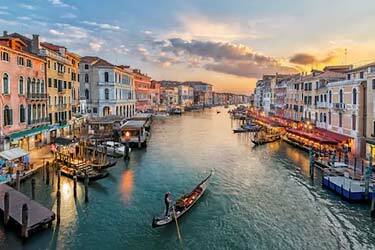 Florence is the region of Tuscany's capital, located in the southern Apennines with the Arno river that runs through the entire city. Florence has a variety of historical attractions and museums. For those who love food and drinks you can almost everything here. Cozy local restaurants (trattorias), comfortable bars and gourmet restaurants. If you want to get the most out of your time in the city you should go in the spring or autumn when the climate is the most pleasing.